Wreath Pro was Awarded Best Product by Orca Communications Unlimited, LLC. You’ll love Wreath Pro adjustable wreath hanger. Because it makes hanging wreaths a snap. Plus, just “fits” your décor, no matter the season. When was the last time an over the door wreath hanger actually made the wreath look nicer? How about never. Well, Wreath Pro actually enhances the look of your wreath, whether it’s used as a door wreath hanger, window wreath hanger, or anywhere similar. And big, heavy wreaths? 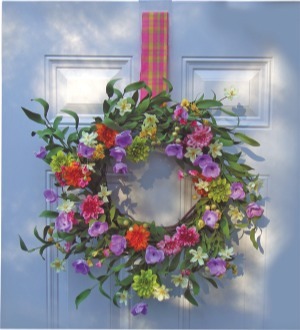 No problem – Wreath Pro will handle any wreath you hang from it. Ok, we realize “wreath hangers” are far down the list of modern problems. However, hanging a wreath can be extremely frustrating. Most metal wreath hangers and those cheap plastic so called "adjustable wreath hangers" just don't look very good and some can actually damage your door. Why mess with suction cups that don't hold? No one wants to come home and find their wreath on the ground! Why do professional decorators always hang a wreath with ribbon? Because it looks nice and it works! Now, with Wreath Pro you can get the same great looking results as the professional decorators, Wreath Pro makes it easy! If you need to hang a wreath on a tall door or a door with moldings or windows, Wreath Pro is the answer. Wreath Pro works on double hung windows too, adjust it to any length for the perfect professional decorator look. Don't "rig" your wreath with a wire, fishing line or a nail, your front door wreath should be inviting and welcome your guests. Wreath Pro makes it simple, fun, and a LOT better looking. Buy it once, and use it forever. Not convinced that Wreath Pro is the most versatile, best wreath hanger on the market? Visit our FAQ page or take a look at the customer success stories and see why Wreath Pro truly is the last wreath hanger you will ever need to buy. Visit our store now. Made in USA from high quality components Wreath Pro will last for years. Wreath Pro comes with your choice of ribbon color. However, Wreath pro’s unique hangers can utilize any 2.5” wire edge ribbon, which is available in thousands of hobby and craft stores nationwide. So one Wreath pro can handle a year’s worth of decorative wreaths. You can see our ribbon selection at the bottom of any Wreath Pro hanger page in our store Just select a Wreath Pro style and scroll to the bottom to see our ribbon. No wreath is too heavy or too bulky for Wreath Pro. The two hangers (one for the door/window and one for the wreath itself) are made of super-tough polycarbonate construction, and are nearly indestructible. Yet, this super-strong decorative wreath hanger will not corrode, rust, or scratch / damage your doors and windows. We love our holiday decorating in the US, and we love our Wreath Pro’s!! Wreath Pro uses coordinating ribbon, and allows you to hang your wreath like a professional decorator. No unsightly suction cups and no flimsy cheap looking metal hooks. Wreath Pro gives professional results every time. Finding the perfect size wreath hanger to hang your wreath on a window isn't easy. Window wreath hangers are always to long, to short nor use unreliable suction cups. Not any more! Wreath Pro allows you to hang your wreath exactly where you want it on standard double hung windows using ribbon, just like the professionals. Is Wreath Pro an adjustable wreath hanger? Yes, Wreath Pro is fully adjustable to almost any height. It’ll work anywhere you need it to work, with any wreath. Why Wreath Pro? Why not a five dollar metal wreath hanger? Well, you can use a metal hanger if you wish (heck, you can use a coat hanger or duct tape if you want as well.) But metal hangers don’t work very well, and they don’t look very good. They scratch doors, they are almost impossible to use if your door has an upper window (like the one in our photo), And they don’t work well with large wreaths (making doors hard to close, etc). Wreath Pro, on the other hand, has none of those disadvantages, and simply looks beautiful as well. That’s why professional decorators use it. Can I use Wreath Pro for other types of wreaths? Indeed you can. We have a large selection of colors that will ensure your Wreath Pro looks great no matter what type of wreath you use – spring wreaths, autumn wreaths… any wreath..
Can I hang my wreath on a tall door? Yes!, Wreath Pro is fully adjustable so you can position your wreath exactly where you want it. Wreath Pro comes with 36 inches of ribbon but if you need even more, you can use any 2.5 inch wire edge ribbon. We have a nice selection of ribbon. To see our ribbon selection select any Wreath Pro style in our store and scroll to the bottom of the page. Those metal over door wreath hangers won't work on my door because of the window. Will Wreath Pro solve this issue? Yes! 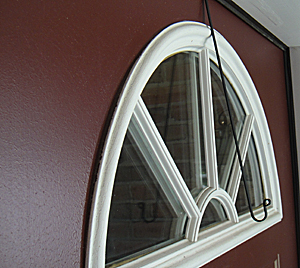 Wreath Pro works great on doors with windows, and it looks attractive inside and out. I can't use those magnetic wreath hangers I have a wood door. Wreath Pro works on all standard doors, wood, metal, fiberglass… with or with out windows. Wreath Pro also works on doors with textured surfaces that suction cup type hangers fail. How do I hang a wreath on my window? Use Wreath Pro! Wreath Pro is designed to work with standard double hung windows as well as doors. Can I buy other color ribbons for it? Yes, Wreath Pro works great with any 2.5” wire-edge ribbon, which is widely available in craft and fabric stores nationwide. So one Wreath Pro can be used year round. To see our ribbon selection select any Wreath Pro style in our store and scroll to the bottom of the page. Can I buy Wreath Pro on this website? Of course you can. Click here to order. Do you wholesale Wreath Pro? We sure do – click here to contact us. Here is my success story. We live in a really old house and my husband would never let me hang wreaths because he didn't want me to ruin the antique doors. Then I found Wreath Pro! He approved and now I have Wreaths. Where have you been all my life? I've tried nails, hooks, metal wreath hangers, suction cups….none of them offered the ease, adjustability and versatility that Wreath Pro does. You're a keeper. This wreath hanger is a winner! Not only can I adjust my wreath to any height and change the ribbon to match my wreath and the season, Wreath Pro lets me add a twist or two of my own, like the bow I tied at the top of the door. Good Bye metal wreath hangers. This is the first time I've ever been able to hang a wreath on my front door right where I want it. The adjustable ribbon idea is so clever. Before finding WreathPro, I couldn't hang these adorable door accents without problems. Metal wreath hangers didn't look right and I didn't want the permanent holes that nails would leave. WreathPro is perfect because you can't see the hook, the ribbon is pretty and adjustable. LOVE IT! I have a few windows that I've always wanted to hang a wreath on but was always disappointed with the outcome until I found your WreathPro. I'm sending a picture along to show you how I opened the top and used the hook to hang it. The window closed tightly and the wreath looks great! I'm telling all my friends. Thanks for offering such an easy fix! Look at this! A metal bucket with a plant inside is hanging from a gate! Last year we tried this other ways without much luck. We loved the look but when the bucket toppled over we gave up. Then we tried Wreath Pro and it worked! Two wreaths on the same door! Wreath Pro Makes hanging two wreaths easy as can be! And beautiful, too. Our gate welcoming friends has never looked better thanks to your WreathPro! To buy Wreath Pro right now, click here. To inquire about wholesale opportunities or private label click here or use the form below.